View of the ruins of Cologne, from the Zeppelinstrasse shopping district to the Hohe Domkirche Saint Peter und Maria, commonly known as the Kolner Dom (Cologne Cathedral) built between 1248 and 1880. The ruins of the Hohenzollern Bridge at at the extreme upper right. Cologne was the subject of 262 raids, including thirty major ones, during World War II. On the night of May 30/31, 1942, Royal Air Force Bomber Command Air Marshal Sir Arthur Harris approached Winston Churchill with the idea of launching 1000-plane raids on German industrial targets. Cologne was selected, officially because of its railroad hub, but unofficially because of the prospect of good weather over the target. Denied the use of bombers from Coastal Command, Harris pulled crews and aircraft in training, gathering a force of 1,047 two- and four-engined bombers. 1 Group sent 156 Vickers Wellingtons; 3 Group, 134 Wellingtons and 88 Short Stirlings; 4 Group sent 131 Handley Page Halifaxes, nine Wellingtons and seven Armstrong Whitworth Whitleys; 5 Group sent seventy-three Avro Lancasters, forty-six Avro Manchesters and 34 Handley Page Hampdens; 91 Group, an operational training unit (OTU), contributed 236 Wellingtons and twenty-one Whitleys; 92 OTU Group flew off sixty-three Wellingtons and forty-five Hampdens; and finally, Flying Training Command sent four Wellingtons. Aircraft totaled 602 Wellingtons, 131 Halifaxes, 88 Stirlings, 79 Hampdens, seventy-three Lancasters, forty-six Manchesters, and twenty-eight Whitleys. 868 aircraft bombed the main target with fifteen aircraft bombing other targets. 43 aircraft were shot down or crashed returning to base, including two that collided over the target. Additionally, Fighter Command sent aircraft against airfields, and Coastal Command performed Air-Sea Rescue for the stricken crews. 1,455 tons, mostly incendiaries, stuck the target within an hour, starting 1,700 fires, but did not combine into a firestorm. 3,300 commercial or military structures were destroyed, along with 13,000 homes and apartments, and a further 40,000 structures damaged. Less than 500 civilians and military personnel were killed, but 150,000 civilians evacuated after the raid. 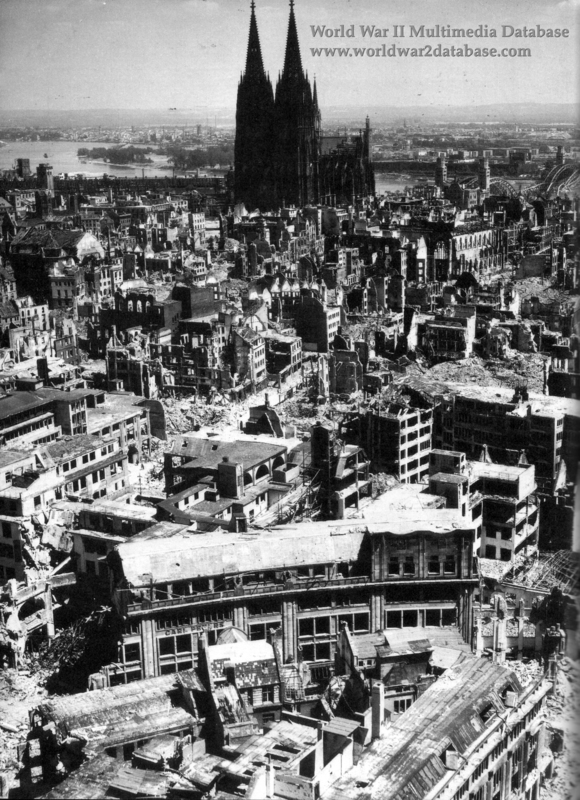 By the end of World War II, 90 percent of Cologne was damaged or destroyed. Since the Cathedral was a favored initial point for bomb runs, it was struck by errant bombs fourteen times. Repairs to the Kolner Dom were completed in 1954. On August 25, 2007, the south transept was replaced with a new stained glass window, designed by computer, to replace the plain glass installed after the original was destroyed during the bombing.